Today's winners are four NHL game officials. Referees Marc Joannette, Frederick L'Ecuyer and Linesman Brad Lazarowich, Tony Sericolo. 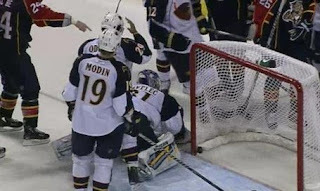 The Florida Panthers lost a game last night that should have ended no worse than a tie game at the end of overtime. The proof of what I say is in the photo beside this passage. Defenseman Bryan McCabe fires a shot at Atlanta Goalie Ondrej Pavelec. Nobody rules it a goal. Florida tries to protest, and call for a review. The NHL reviews questionable goals or non-goals all the time. But no these four blind mice don't stop for a war room review but drop the puck. Take at look at the photo. THE PUCK IS IN THE NET. No question about it and there was video footage of the Goalie taking the puck out too. This is the third time Florida and its fans have been screwed over by NHL officiating in a game. There was the kick in Edmonton, thttp://www.blogger.com/img/blank.gifhe tackling of Goalie Scott Clemmensen in Toronto that led to a goal and the NHL admitting the goal should have disallowed and Toronto penalized. There's a definite pattern showing in NHL officiating in regards to the Panthers and I'm not the only person seeing it. There's either two sets of rules in the league or game officials on the take and rigging games. It don't matter which it is, I name NHL Referees Marc Joannette, Frederick L'Ecuyer and Linesman Brad Lazarowich, Tony Sericolo today's Knuckleheads of the Day.